Juliette can’t won’t touch anyone. If she touches someone, they could die. She has been locked in a cell room as a safety precaution for a long time. Adam is her new cellmate. To be locked in with someone is extremely risky and Juliette doesn’t understand what is happening. Since the Reestablishment, things in the world have not been the same. They are at war and the army wants to use Juliette as the ultimate weapon. The only thing Juliette needs to do is to want it too. Is this curse gift going to rip Juliette’s life apart? Shatter Me just blew me away. It was fantastic. No it was beyond fantastic, it was one of the best books I have read in a while. I didn’t know what to expect from this debut author, Tahereh Mafi. I’ve seen some of her videos on Youtube and had read some interviews on blogs, but I really had no clue what to expect from this book. I am shocked that it has taken me this long to sit down and read it. Shatter Me is one my favorite books of the year. You can read about my thoughts on the cover HERE. This book reminds me a lot like Rogue from XMan. That is not necessarily a bad thing. I love Rogue and to hear Juliette who has the same power as Rogue is definitely a twist on how I see the power. Juliette is so independent and clever; I know I would have probably gone crazy in an asylum but she seems to keep it together. There is one thing that I didn’t truly understand. Before reading this novel, I knew there was going to be a love triangle. I was ready for one. Are you Team Adam or Team Warner? But upon reading this book, I don’t understand why anyone is Team Warner. There is a sequel so it might be further explained in that book. But Warner is obsessed with her power, not in love with her. As of right now, I am not choosing sides because I don’t really care for my choices so I’ll get back to you on that. However, this is the exact point I am trying to make. This is what the book is doing to me. It is making me question sides. It is making me question everything. Mafi’s plot is so interwoven with twists and turns that I am constantly questioning what is going on. Her writing is genius. 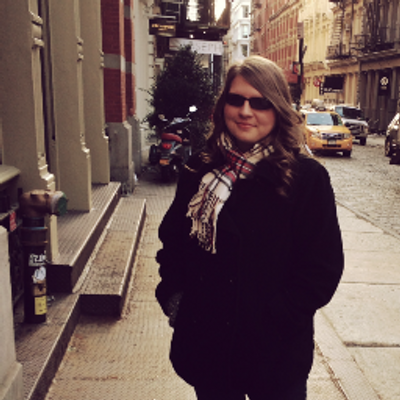 Juliette, in first person, was a perfect way to go but that’s not all. The entire thing is written in stream of consciousness and you have words and phrases crossed out, Juliette second guessing herself. I haven’t read a book in stream of consciousness in a while and to be fully immersed in the work is something I truly loved. Oh, and Mafi has a way with her figurative language. I just couldn’t even… I don’t even know what to say, Mafi is a fantastic writer and I can’t wait to read more works from her. Compared to the entire book, the ending was a little disappointing. There is a sequel, so I will definitely be diving into that one as soon as I can. Throughout the entire book, I was jumping up and down, out of my seat, constant action and then I felt like the book was like my exercise routine. I start out on the treadmill a little quicker than I should, get the work out part out of the way, and then cool down. No book needs a cool down. I was ready for the ultimate cliffhanger, which there was but it wasn’t a very oh-my-gosh cliffhanger. The cliffhanger didn’t hit me as hard because Mafi was putting us through a cool down. Overall, this book is one of my favorites. If you haven’t read this one yet, you need to go get a copy and dive in. This is one book that you do not want to miss. 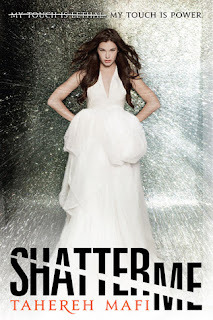 If you love dystopian, XMen, or even figurative language, you are going to fall in love with Shatter Me just like I did. Rated PG-13 for excessive touching (ironic, right? ), violent scenes, blood and gore, and incredible action sequences. I also really liked this book. The action was so well paced.